In International Baseball Culture, I look at baseball-related entertainment from outside the USA that isn’t bizarre, but is interesting, perhaps learning some new things along the way! In 2005, the Japanese television station TV Asahi held a special on the 100 most popular anime (animation) in history, as voted on by Japanese viewers. 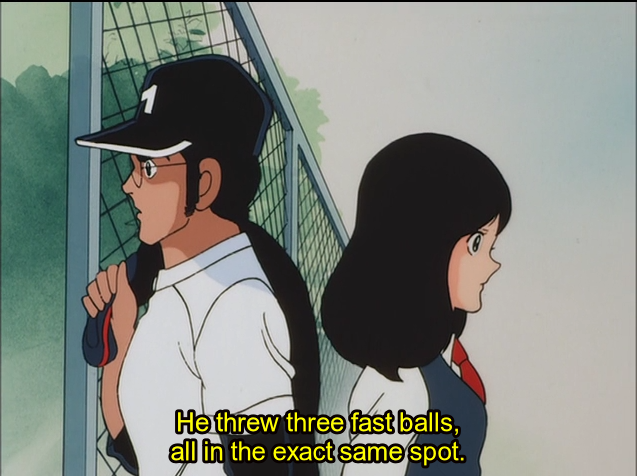 While many of the most popular programs were fantasy, adventure or science fiction, such as the Gundam series of giant robot programs (at number two) or Dragon Ball (at number three), the top ten also had a baseball anime: Touch, which was seventh. What is Touch? Well, to put it in simple terms, it’s a tale of two stories: the baseball one and the off-the-field one. It’s about three teenagers (twin boys and their girl-next-door neighbor) who navigate high-school, relationships and their pitfalls while trying to bring their school glory on the diamond as they try to reach Koshien, Japan’s national high school baseball tournament, which is like March Madness and a Friday night in Texas combined. Needless to say, it struck a nerve with Japanese audiences, and the 2005 program’s polling was not that out of the ordinary: A follow-up list that included votes from after the TV Asahi special was aired also had Touch in the top ten, at number nine. 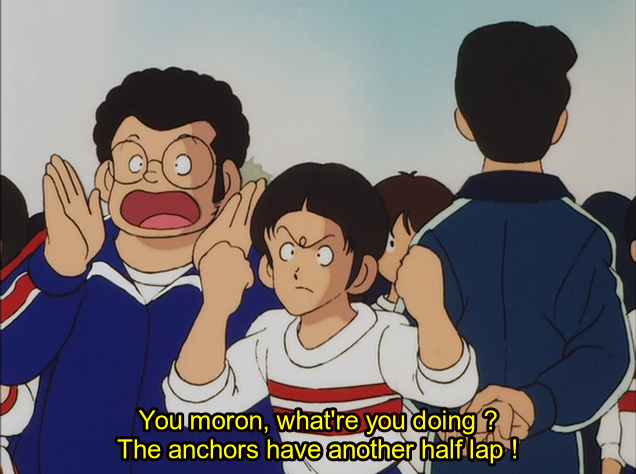 Nor was this a recent phenomena, either: during it’s original run in the 1980s, it was, according to some sources, the most watched anime in the history of Japan. Ever. 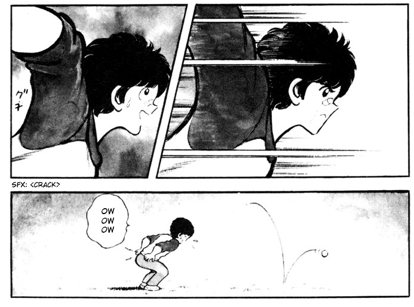 The series was, in itself, adapted from a manga (comic) of the same name, written and illustrated by Mitsuru Adachi, that saw it’s volumes sell over an estimated 100 million copies. Just to put that in perspective, in 2010 the population of Japan was around 128 million. Of course, that doesn’t mean over three out of four Japanese people owned at least one copy of a volume of Touch… but it does mean that those who did liked it very much, buying every volume. 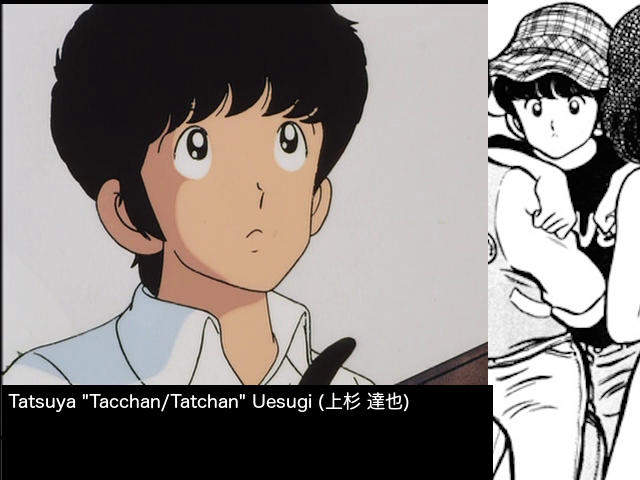 And yet, despite the fact that Touch is one of the most successful anime and manga in the history of Japan, it has never seen official release in the United States, and it’s unlikely that it will anytime soon, either (the anime and manga import market is mainly focused on recent releases, and what old ones that do happen are usually Sci-Fi or Fantasy). However, there is apparently a unspoken agreement between the Japanese entertainment industry and it’s English-speaking fans that they won’t sue anybody who translates and distributes translated versions of the show/book, so long as they stop doing it if an actual agreement to distribute them in the USA is made, so I was able to find copies of both the anime and manga online. Now, first thing’s first, Touch is loooooong. 101 episodes on TV, 26 volumes in print. So, needless to say, I am NOT going to be covering all of it in one go. Instead, it’ll be a weekly thing- sometimes bi-weekly, going up on every Friday. The stories are almost identical (although there are differences here and there), so in general I’m using whatever screenshot I like better (if I feel the anime shows something better, I’ll use a screenshot from that, if I feel the manga shows something better, I’ll use a screenshot from that). Second off: Touch is realistic. Sometimes depressingly so. Aside from dream sequences and a few stylized comedic touches to add a bit of flair (a overly-intelligent dog, neighborhood bullies with Ninja equipment), there isn’t much in it that seems like it couldn’t happen in real life. If I were to place it on a sliding scale of baseball reality, with zero being a work where baseball is portrayed in name only (i.e. 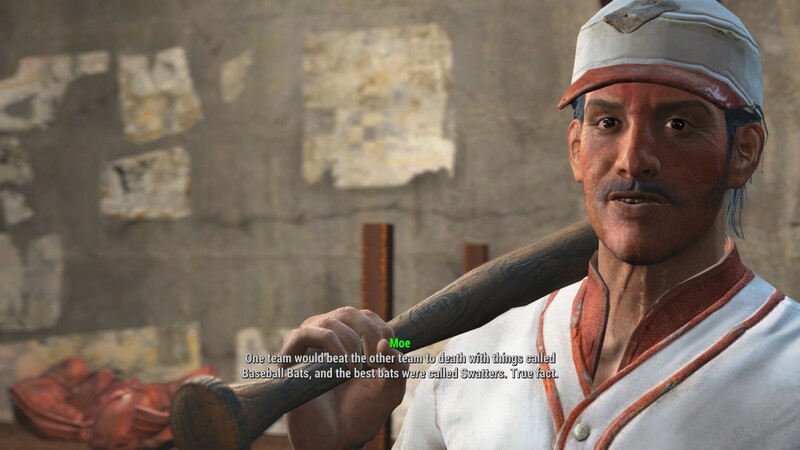 if it were a depiction of Moe Cronin’s idea of baseball) and ten being a actual recording of a real-life baseball game, I’d say it’s usually a solid seven or eight, at times going up to a nine and never falling below a six outside of dream sequences. Finally, due to the length of this series and the subject of this blog (it is the Baseball Continuum, after all), I’m mainly going to be focusing on the baseball stuff, but I still will be recapping the off-the-field stuff too, just not to nearly as great a length… ESPECIALLY early on, because, you see, in some ways the first quarter of the story is just a romantic-comedy set-up for the true baseball drama of the majority of the story, with the characters and conflicts being introduced before a major event truly sets the story in motion. 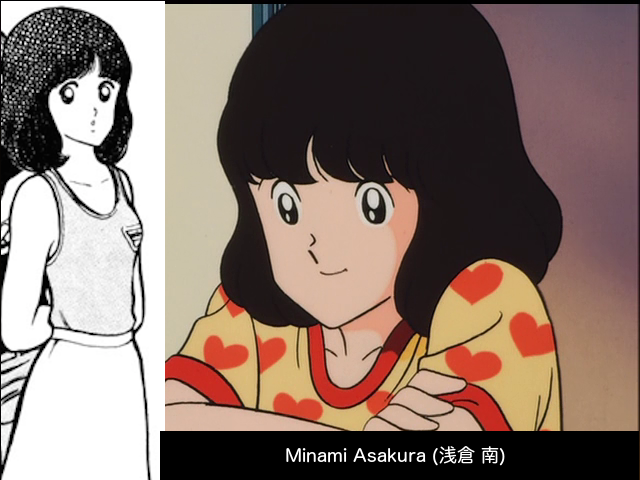 This blog entry mostly covers that set-up, which covers the character’s first : the first ten episodes of the anime and first three volumes of the manga. There are the Uesugi twins of Tatsuya and Kazuya, often called “Tacchan” (or “Tatchan”, the translation differs based upon who is doing it) and “Kacchan” (“Katchan”) by their friends, a combination of their names and the Japanese honorific -chan, which is used when talking to close friends, lovers, children, pets and between women. How we first meet them in the anime is telling of their personalities, while we first meet Kazuya doing early-morning exercises, we first see Tatsuya sleeping in too long and then running to school, barely getting their before it starts. 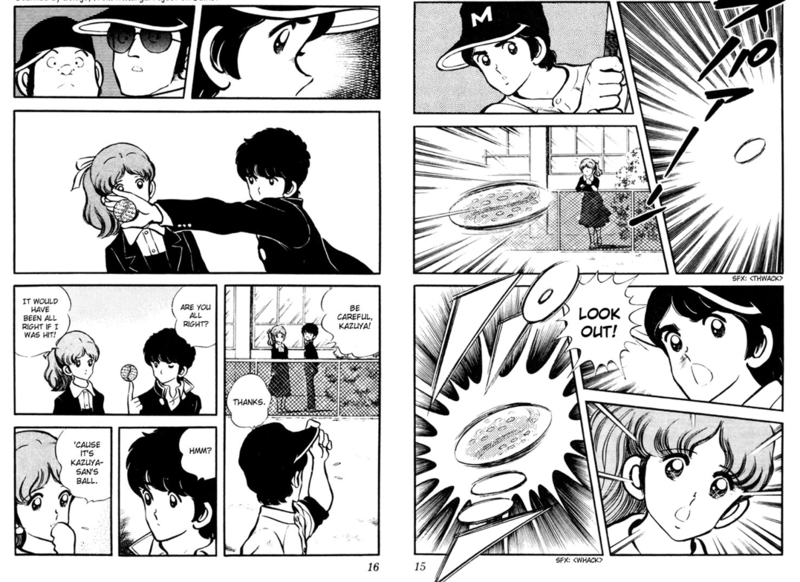 In the manga, these events are only implied, but the characterization is constant: Kazuya is the good student, the good athlete, and the one beloved by almost everyone, while Tatsuya is lazy, out of shape, and kind of a creep. Can you see the difference? Well, it’s like this: Tacchan (usually) has more spikes of hair on his brow than Kacchan. So, yeah, there’s a love triangle. Everybody seems to have already decided that Kazuya and Minami are going to end up married, much to their mutual (at least public) embarrassment at the idea, while Tatsuya only gets dates when he impersonates his much more popular brother (again, Tacchan is a bit of a creep). 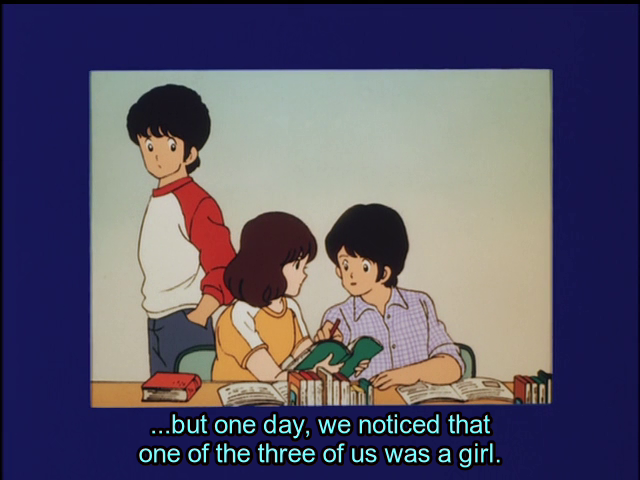 However, it’s made clear during these early stories that Minami cares deeply for both of the brothers, but may hold more of a romantic interest in Tatsuya. The main baseball part of the story, as it apparently is in many Japanese works of fiction dealing with baseball, is Koshien. As I have said before (both in this post and elsewhere on the blog), Koshien is the site of (and in practice the name of) the large high school baseball tournaments in Japan that are extraordinarily popular, especially the National High School Baseball Championship held in summer. I described it earlier as if you were to cross March Madness with HS Football in Texas, and that’s probably not a bad description, as it takes precedence over basically everything else and the final rounds are broadcast through the country and even the NPB’s Hanshin Tigers who normally play at Koshien Stadium are kicked out for a few weeks every year. In addition, it’s often where big-time baseball players first make their names: Sadaharu Oh’s first spotlight in Japan came at Koshien, as have most of the Japanese players who have come to MLB. Minami also talks about how Kacchan has promised her that he’ll bring her to Koshien when she goes. Seriously, Koshien is a big freaking deal. And this is all happening while the characters aren’t even in High School yet (which is the equivalent of grades 10-12 in Japan), but rather in Junior High (in Japan, that’s the equivalent of grades 6-9), and in Japan (unlike in America, where you see 9th graders and sometimes even younger play for HS teams) a person of Kazuya’s age isn’t even eligible to play in Koshien yet! This is partly what contributes to the fact that the baseball is a bit thin in the early part of the story that I’m covering this week: while Kacchan is playing baseball, it’s not really part of the whole Koshien storyline. Still, we get some hints at athleticism from Tatsuya: He catches the eye of the (female) clubhouse manager of the High School team, Sachiko Nishio, who is impressed by his skill in swimming, although she thinks he’s actually his brother. The role of manager in Japanese HS baseball is something I’ll expand upon later, but for now I’ll just leave it as being that Japanese High School teams often have a girl taking care of equipment, recruiting players, and statistics. She and her boyfriend, the HS team’s star pitcher and hitter Takeshi Kuroki, discover the truth when they show up at the Junior High practices. While there, Kuroki also humiliates Kacchan by taking a spot in the batter’s box and hitting a HR off of him (the first time ever, according to the manga). He then throws some serious shade after: Despite this, Kuroki makes it clear, especially in the manga, that he believes Katsuya has more skill than him, and so he transitions to third base. Also, Nishio believes that Tatsuya also has great baseball talent, and later tells him that he should consider playing for the baseball club once he gets to High School. At one point, the requisite “twin switch” is done for a Junior High game after Katsuya injures himself trying to get underwear that was out to dry in a high-up place (seriously). Tatsuya proceeds to have one of the spasms that I had a picture of earlier, and thus he balks in the winning (or, in his case, losing, run). The biggest indication that Tacchan may be a great baseball player, however, comes when he plays in a amateur sandlot game with Minami’s father and a few of his friends. He fields well in the outfield simply by positioning himself well before each play, although when he misjudges where to position, he allows a ball to go to the fence. Then, though, Katsuya arrives from a date with Minami and takes the spot on the opposing team when their pitcher has to leave. Inevitably, it turns into a showdown of brothers. Now, at this point in the storyline, Tacchan owes a schoolmate 36,000 yens (about 300 dollars using 2016’s exchange rate) for a new pair of binoculars that Tatsuya broke while trying to spy on some pretty girls (again, Tatsuya is a perv), so Tatsuya agrees to face his brother if he gets 36,000 yen for getting a hit off of him. You can probably guess what happens then: Home Run. So, yeah, Tacchan proves he has some ability in it, even if he need to be motivated by things. Actually, that’s a running theme throughout these early stories: when he’s motivated (whether by money, by girls or by a sense of pride), he’s great. When he’s not, he a lazy perverted teenager. Of course, even when he IS successful, he still screws up: this home run hits the side-mirror of a passing businessman’s Jaguar, putting poor Tacchan in the hole for 40,000 yen. Ouch. 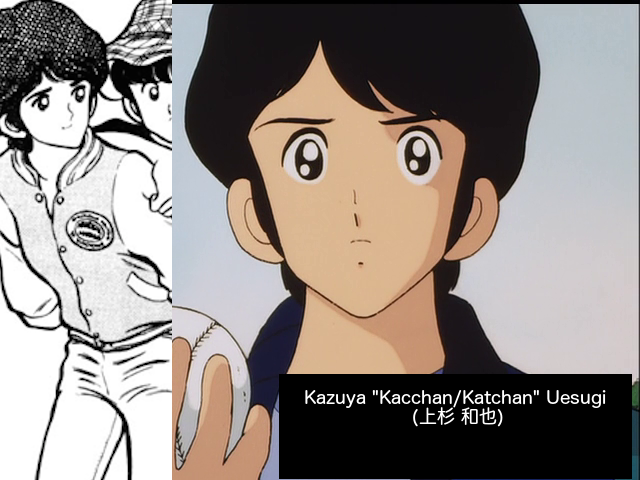 There are a few other baseball storylines: We are introduced to Kacchan’s catcher, Kotaro (or Koutarou or Kotarou, it’s transliterated a few different ways), a big portly catcher who hits well for power but not contact. He’s worried that arriving in High School will cause him to lose his spot on the team. 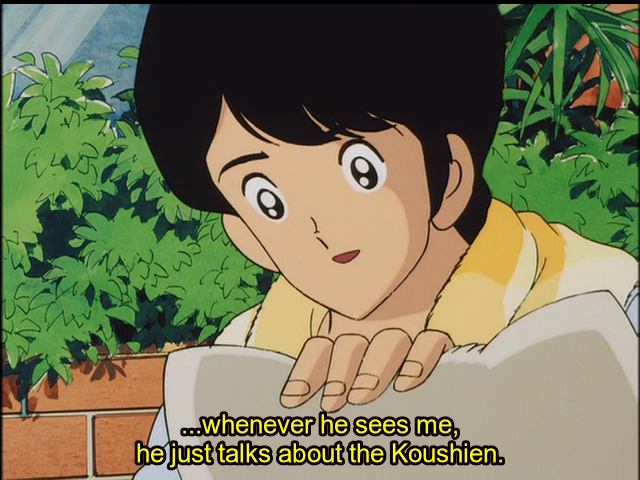 He also is pretty dismissive of Tatsuya whenever he shows up. And, finally, we hear about an ace pitcher for another school that is doing great in the Spring Koshien, which is an invitational tournament. Along the way, of course, there are the standard sitcom/rom-com follies and such, some of which are pretty funny (like the friendship between Tacchan and Harada, the school’s big bully-with-a-heart-of-gold), but due to time and the fact I’m more focused on the baseball, I’m not going into detail on that… for now. NEXT TIME ON INTERNATIONAL BASEBALL CULTURE: “Touch” Part 2, where Kacchan’s high school baseball career truly begins! 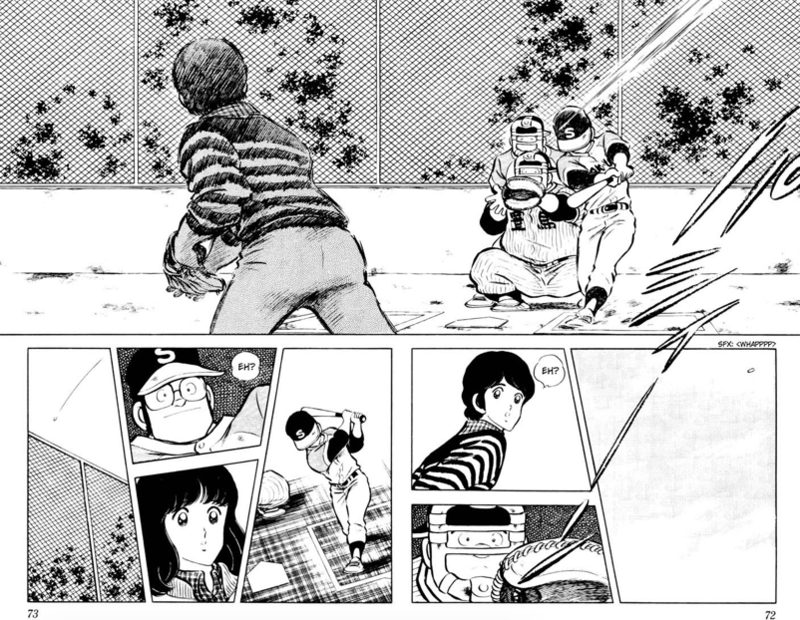 This entry was posted in Baseball, Indy and Amateur, International, Uncategorized and tagged Anime, baseball, Blogathon, International Baseball Culture, Japan, Manga, Mitsuru Adachi, Touch by danglickman. Bookmark the permalink.